Solo: A Star Wars Story – Beforehand, I had a really bad feeling about this. Why? when I first heard about the man who was playing Han Solo, I was instantly disheartened. It’s Alden Ehrenreich (Rules Don’t Apply). My choice – as I’ve said many times before – would be Anthony Ingruber (below) who played a young Harrison Ford in The Age of Adaline. I mean, he actually LOOKED like him! Another of the biggest problems for this is that while Mr Ford has buckets of charisma, this new guy has zero. And if you don’t ‘feel’ it, as I didn’t, then you’ll be lost – with him as Han – for the entire movie. It may as well be any old cheeky character getting into ridiculous and uninteresting scrapes. For the rest of the cast, that doesn’t get much better. The love interest, Qi’ra, comes in the form of Emilia Clarke. I’m not one for Game Of Thrones, so the first thing I saw her in was Terminator Genisys, which was just slightly more pointless and unnecessary as this movie. Lando Calrissian is played by Donald Glover, someone for whom I don’t know a great deal about, but just recently, I chanced upon his alter-ego, Childish Gambino, and a rap ‘song’ entitled This Is America. I had to turn that off after one minute. Utter junk and it’s 60 seconds of my life I won’t get back. 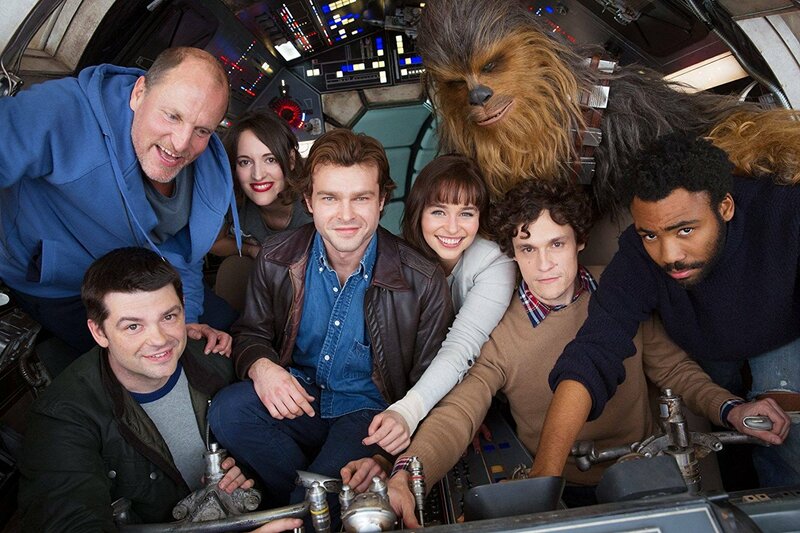 In addition to the cast members so far, who just can’t act, most of the other character members are fairly perfunctory, mainly because you can’t see them as they’re either a CGI robot or in a wookie suit, the former including L3-37, played by Phoebe Waller-Bridge, from BBC3’s godawful, man-hating Fleabag. You do get to see Woody Harrelson as Tobias Beckett, but Woody is Woody in most things, and he’s no different, here. Warwick Davis also shows up as a member of the Rebellion, but he gets one line and a visible grin, and that’s it. 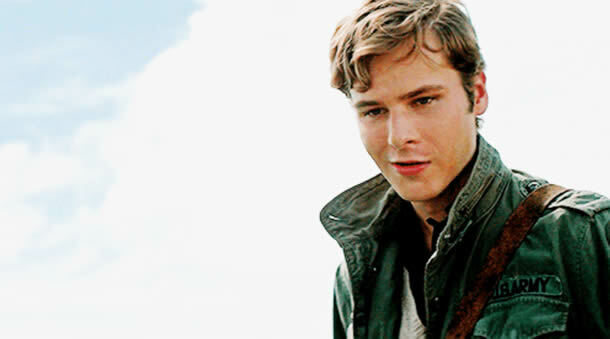 Anthony Ingruber, who should have been the young Harrison Ford. When Han first meets Chewy, they both speak Wookie to each other, with the former’s words being in subtitled form. Soon after, he just speaks English. I never really thought about this whenever I saw Harrison Ford’s incarnation onscreen, previously, so I’m presuming that Han is still speaking Wookie, but it’s like one of those films where we may as well jsut hear it in English to save time. 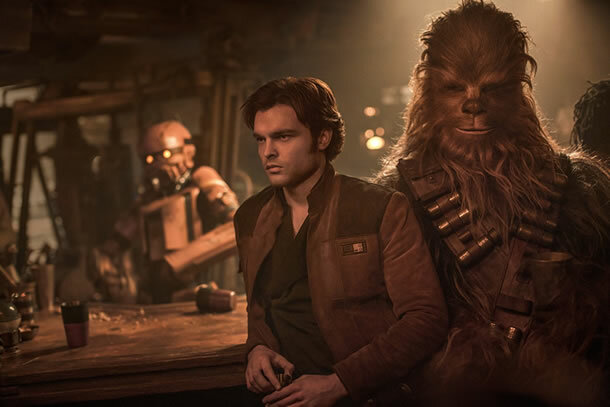 Only the basics of Solo: A Star Wars Story‘s plot were given out in advance, and while that’s mostly what we get in full form, anyway, it boils down to this film telling us how Han Solo met up with Lando and Chewbacca, prior to heading off to join the Rebellion. Naturally, the Millennium Falcon will also come into play, but even when it does, you don’t feel any buzz for it because the thunder was stolen by Star Wars Episode VII: The Force Awakens. There’s also no big opening paragraphs, as those are reserved for the main films. We’re just told in brief text how it’s a lawless time and that various trading is going on, and that the most sought-after element is Hyperfuel. Along the way, there’s one or two ‘surprise’ elements we didn’t expect, but nothing that’s at all interesting. It also speaks volumes that original directors Phil Lord and Christopher Miller were let go, and Ron Howard took over, but whatever films of his you’ve seen in the past – and he’s made a number of great ones – this is NOT his finest hour. Seriously, I enjoyed Rogue One, but Force Awakens was a disappointment, and The Last Jedi was an overlong mess. 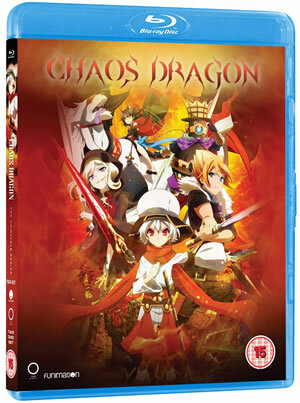 Why isn’t this out at christmas? I thought, at first, it was to tie in with the original Star Wars anniversary, but that came out 41 years ago, not 40. So, I could only presume, originally, that Solo wasn’t good enough to compete in December… and I was right… and in the week it would have come out, Peter Jackson’s Mortal Engines will be on the IMAX screens instead. 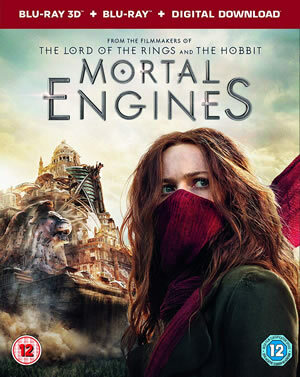 That looks amazing and I hope it’s in 48fps like the Hobbit films were. Even more telling, for Solo: A Star Wars Story, is that I’ve not seen a ton of advertising on TV or on billboards/buses that I’ve seen with every other Star Wars film. That’s not surprising when everyone’s just going through the motions, with dull car chases and a forgettable score, since John Williams is absent – apart from one new track, and elements of his regular Star Wars audio. 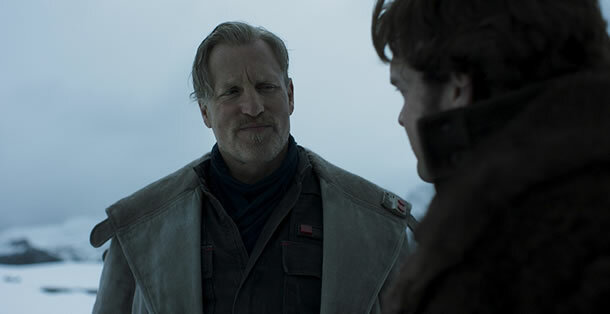 Solo: A Star Wars Story gave us a lot of lazy writing and a dearth of character development. It’s just everything we’ve seen before, except for the fact that there’s no ‘big boss’ battle. Han’s dashboard dice pop up, early on, to remind us he’s Han Solo, there’s a bit where they give him a gun and get him to stand and shoot like Harrison Ford, he gets to say “I have a really good feeling about this”, so, similar to Ford’s “bad feeling”, but a callback nonetheless, and along the way, Chewy roars again during a round of Dejarik, the Hologram Chess game. Quite honestly, I would’ve preferred Solo to be the movie version of the Felicity Kendal sitcom, which ended in 1982 after just 13 episodes. They might have had more people in the auditorium, too. I saw both this and Deadpool 2 at 11am on opening day, and the queue was heaving for that one, but the place was dead for Solo: A Star Wars Story. Some of my friends didn’t even know this was out! 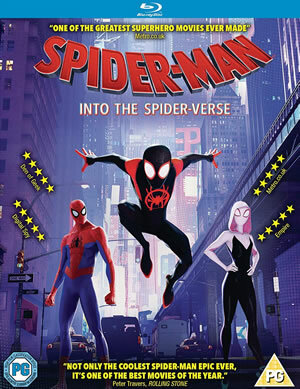 I saw this is 2D, and it’s a given that 3D makes a film look darker, due to the lenses on the glasses, but this film is dark almost all the way throughout! Seriously – do NOT bother with 3D! It’ll be pitch black! Also, it was NOT filmed in 3D, as it’s just another cheap post-production conversion job. And Vue Lowry did their usual idiotic thing of whacking up the lights during the end credits to 50% brightness so the screen is whitened out. A letter to their CEO is forthcoming. How did Han Solo get his name? He’s only known, first, as Han. It’s when he gets separated from Qi’ra that he then has to set off, for a time, on his own. The ticket guard asks for his name. He just gives “Han”. The guard adds the ‘Solo’. About as obvious as an episode of the ’80s sitcom Terry And June, this may as well have been signposted in letters written 10-feet high in walls of fire! UPDATE: Reportedly, Alden Ehrenreich has signed up to three potential Han Solo sequels. Well, I think he can put away his dreams of most wars against the stars for good. Why? Fox will have wanted Avengers: Infinity War-style numbers for this movie, and they’re not getting them. 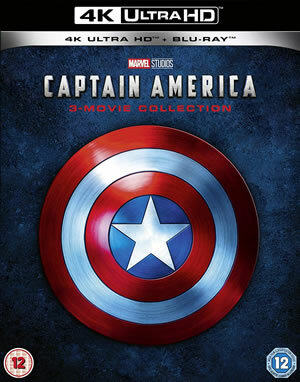 That film cost approx $316-400m to make, and grossed $248m in its opening weekend in the US, and $650m worldwide. 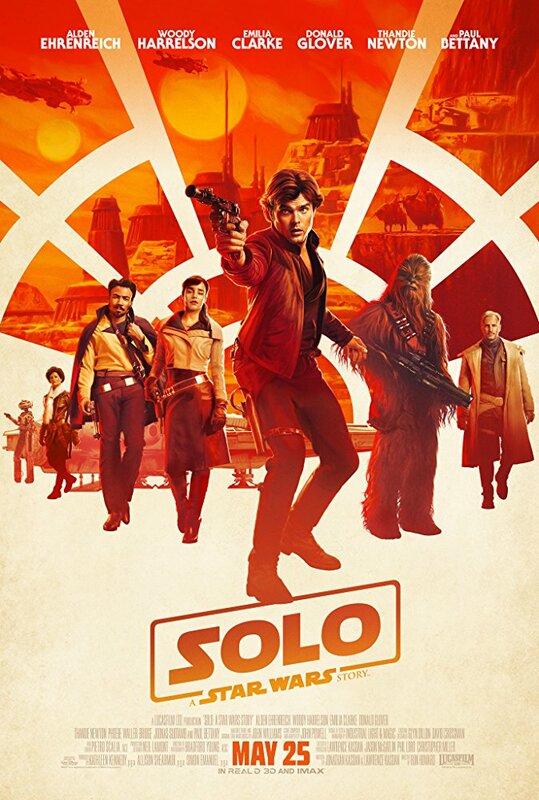 Solo cost $250-300m to make, and can’t even domestically top $100m in its opening weekend, as it’s stalled with $83m in the US, and $148m total worldwide. Whether it stays in the IMAX screens for a second weekend remains to be seen, since last year’s The Mummy reboot was taken out of those, to be replaced with the previous week’s big movie, Wonder Woman. At least, if Deadpool 2 – which sailed to a $125m domestic gross and $301m worldwide, based on a mere $110 budget – takes over for another weekend, then Fox won’t mind so much as they’ll still be raking in the cash from that one, but either way, from June 6th, Han Solo will be crushed by a T-Rex for Jurassic World: Fallen Kingdom. 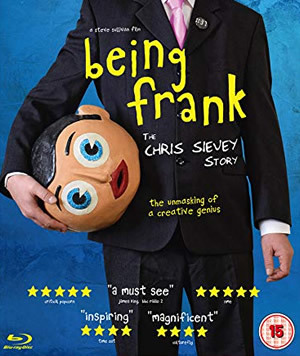 Bear in mind that a film needs to gross 2-3 times its budget to break even, once you take marketing into account, but even if this one does, just breaking even means no-one will bother coughing up the green to see No.2. Solo: A Star Wars Story is available to pre-order on Blu-ray, 3D Blu-ray, 4K Blu-ray, Amazon Prime and DVD. You can also buy the CD soundtrack and Solo A Star Wars Story The Official Guide Hardback book. The cast clearly had a better time making this than I had watching it.